Ida Jo continues her prolific output with the intimate new album For Better For Worse. It is her 4th solo release in as many years, following 2012's raw and energetic Uncharted. For Better For Worse is spacious and personal, full of insightful lyrics and groovy, violin-driven textures. Familiar are Ida Jo's “innovative violin work and her soulful vocals” (AV Club), at turns crooning and belting. “Her voice has the vibrancy of Adele with the soul of Joss Stone. It has the color of history” (Relate Magazine). She uses her violin for everything from rhythm, with her signature "chopping", to melody, ambience and texture. Her playing is "masterful and unexpected" (Emmie Music Magazine). 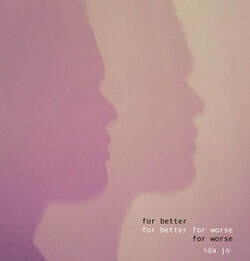 Lyrically, For Better For Worse continues Ida Jo's search for substance in her life and work. The song Glory is about finding value in one's profession. "I woke up as a painter/Thinking it could be enough for me", she sings, hopeful that a vocation can translate to greater meaning. But as the song continues, she changes careers and explores the value of work like writing and singing. It seems there is no simple answer. "Does it ever play out as expected?" she asks in the title track as she takes a step back to gain some perspective. All signs point to no as she guides us through other songs like Juggling, the unvarnished story of a family who has fallen on hard times. In the angelic finale City That Dreams, Ida Jo allows what may be a brief glimpse inside her head. Patient and airy, the song explores the elusive nature of happiness and art. We are forever flirting with the unexpected, and whether we are happy or heartbroken, we are never more than a moment from a reversal. "It's not what it seems", she sings, "In the city of dreams". Even as Ida Jo explores the depths of her art and life for meaning and direction, she seems at peace, or at least comfortable with her role as a musician. Sometimes it is glamorous, sometimes hopeless. "All is as it should be," concludes the title track, "for better, for worse." Copyright 2010 Ida Jo Music. All Rights Reserved.